In 2009 I took the photo below from near the same spot in Euston Road, near the corner with Mabledon Place. Martin-James added a comment suggesting taking a series of photos of these buildings in different light. A nice idea, but I'm not there often enough to follow this through. 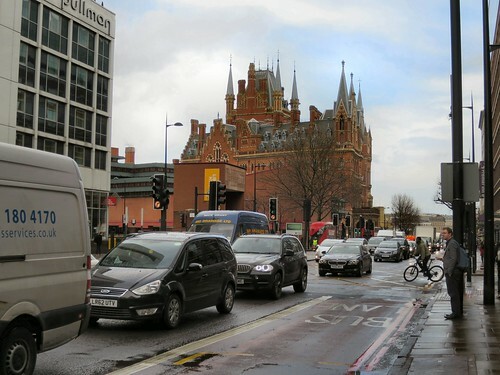 St Pancras and Kings Cross stations and land to the north are among areas of London which have seen enormous change in recent years. Much of which is positive. Although probably lacking sufficient genuinely affordable homes. § British Library Wikipedia Link. 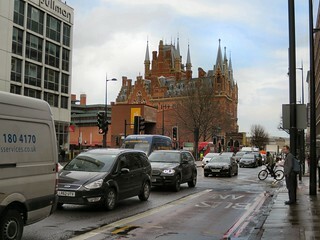 § In 2008 the adaptation of St Pancras Station won a Conservation Award from the Royal Institute of British Architects (RIBA). Read more here. § Alternative view from Midland Road. § More London Air pollution sources to be posted. -§- Link not working? Please let me know by adding a comment below.